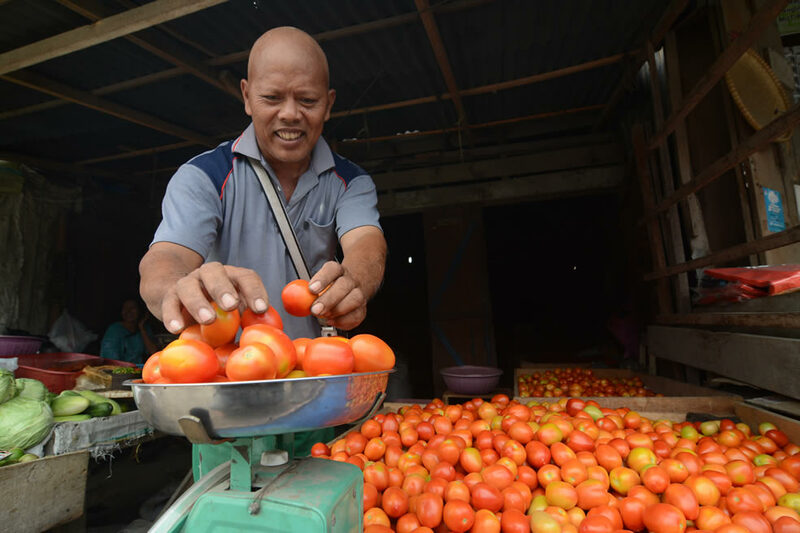 Traders weigh the tomatoes sold at traditional markets in Central Sulawesi, Indonesia. A large proportion of the 26 percent of Indonesians not yet covered under the country's national health insurance program work in the informal sector, representing what some are referring to as the "missing middle." Photo: 2015 Basri Marzuki, Courtesy of Photoshare. JAKARTA—Running large-scale health insurance programs in developing countries is complicated. The potential benefits of sweeping health insurance coverage—improved access to healthcare and protection from high out-of-pocket health expenses—are considerable, but so too are the challenges. How do you ensure that everyone is covered, that the care and commodities they receive are equitable and of high quality, that all key stakeholders are engaged and incentivized, and that the program is sustainable? 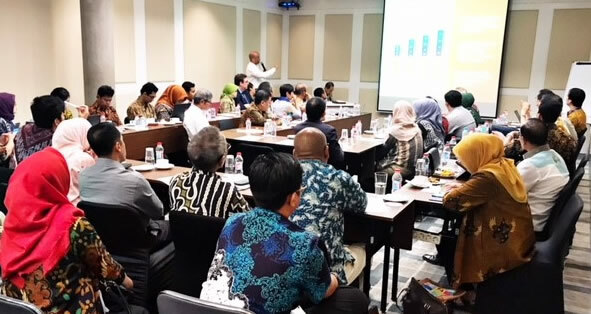 These were the questions up for debate at a series of meetings held last month in Jakarta, designed to tackle the lingering challenges of implementing Indonesia's national health insurance program—Jaminan Kesehatan Nasional (JKN). While these obstacles are neither surprising nor unique to any country managing a large-scale insurance program, what differs in Indonesia is how the government is tackling the challenges head on—a move that, if successful, could have widespread implications for other countries looking to implement social health insurance programs to reach universal health coverage. In just over five years, JKN has managed to bring 74 percent of Indonesia's population under the program—an impressive coverage rate. But of the 26 percent that remain uninsured, a large proportion are employed in the informal workforce. This group, which the OECD refers to as the "missing middle," earn too much to be eligible for the subsidized coverage offered to the poor and near-poor. While some of the missing middle and their families may participate in other programs or private insurance, it is critical for those who do not to join and remain enrolled in JKN to get the benefits of financial protection and increased access to care. For them to join, they must see the likelihood of the program increasing their access to more affordable and higher quality healthcare. Even if Indonesia manages to reach that elusive missing middle and bring them into the program, ensuring that enrollees receive equitable care and benefits—regardless of geography and income—will remain a challenge. Poor and near-poor households and eastern provinces have seen the most growth in healthcare use, although they still lag behind wealthier populations and urban provinces in overall use and per person hospital expenditure. To address this gap, more progress is needed to reduce non-financial barriers to accessing healthcare, such as proximity to health facilities and clinic wait times, which may require the government to target its spending more effectively, investing primarily in facilities and health workers in the rural/eastern provinces and areas serving the poor. As more and more people join JKN, the public sector is not positioned to meet the growing demand for health services on its own. To ensure the effectiveness and sustainability of the program, the government must better engage the private sector. But this partnership raises its own series of challenges. Through a partnership with JKN in which the private sector gains a higher volume of clients, there is concern that the reimbursement rates remain insufficient to cover the overall costs that private hospitals incur as compared to the public sector. So, the question becomes, how can the government establish reimbursement rates that incentivize the private sector to provide quality care while keeping total healthcare cost in check? HP+’s Arin Dutta presents at one of two meetings held last month in Jakarta to explore the persistent challenges of managing a large-scale insurance program. JKN payment processes are also impacting pharmaceutical and medical device companies. While the scheme endeavors to establish a thorough claims verification process, the delays in reimbursement while claims are being reviewed have affected payments by hospitals to pharmaceutical and medical device manufacturers, risking stock-outs of essential drugs and commodities. How can the government maintain a level of cost-control while still ensuring JKN patients are receiving high-quality services, medications, and devices? As the government tackles these questions, they will also need to put in place clear and transparent processes around reimbursement rates, provider payments, and cost-control measures. Participants at the meeting brainstormed different policy options, from cost-sharing with patients, revisiting reimbursement levels, strengthening the procurement system for pharmaceuticals and medical devices, and strengthening coordination between government entities and private industry. But it is not just the private sector that needs to be well-engaged. Too often in many countries, issues around how to finance and operate a country's health system are made by technocrats at the highest levels, behind closed doors. Indonesian government entities overseeing JKN are engaging and should continue to engage a wide range of stakeholders along the way to fully understand the issues and policies of the program, help identify the challenges of implementing JKN, and become vested partners in crafting workable solutions. In the coming months, TNP2K and HP+ will release their anticipated assessment of JKN, which will further inform these critical discussions. With that evidence as well as the motivation and resources of the Indonesian government and the early engagement of key stakeholders, Indonesia is well-positioned to find innovative solutions to the persistent questions of how to successfully implement a large-scale national health insurance program. If they do, it could be a turning point on the road to universal health coverage for Indonesia and countries beyond. The Government of Indonesia is conducting a comprehensive assessment on JKN, coordinated by TNP2K, with technical support from HP+.